And a fast new ship joins the ranks. Today marks the release of Beyond: Chapter Four, the latest free update for Elite Dangerous. There’s a lot in it, from massive quality of life improvements to minor bug fixes. But the most exciting thing, for me anyway, is a complete overhaul of how exploration works in the game. I don’t play Elite to shoot other ships: I play it to fly around looking at stars and planets and enjoying the austere sci-fi atmosphere. But I always found the actual systems attached to this aspect of the game boring after a while. Exploring just wasn’t rewarding or engaging enough for me to put any serious time into it. But that’s all changed with the introduction of a new scanner. When you jump into a fresh, unexplored system, you can switch to a new FSS, or Full Spectral System, mode. Here you can release an energy pulse (or a honk as Elite veterans often refer to it) by holding down the assigned key, which populates a ‘filtered spectral analysis’ chart at the bottom of the screen with readings representing objects of interest in the system. These readings won’t look like much at first, but the idea is that the more you use the new FSS scanner, the better you’ll get at recognising the things they represent at a glance. A reading with high, sharp peaks, for example, means there’s probably something large such as a gas giant in that part of the system. And other objects—be they metal-rich planets, Earth-like worlds, asteroid belts, or icy bodies—have learnable patterns. But if you want more detailed information, you can ‘tune’ the spectral analysis chart, just like you’d tune an old radio, to find out more about an object. Drag the dial over one of the spectral analysis readings and you can zoom in. Sometimes it’ll be a single body, other times a collection of them: a gas giant orbited by a bunch of small moons, perhaps. This brings up a list of stats for the object such as its mass and atmosphere, to more useful information: resources you can harvest, say, or locations you can visit. And when you confirm the location of a planet or whatever it is, the reading on the spectral analysis chart will change to show that you’ve discovered it, slowly building up a clear, visual map of the system. This whole system is a massive time saver, because before you’ve even flown anywhere in a system, you can find out what planets and other bodies there are, what they have to offer, and whether there are resources such as geological sites to discover. You can decide immediately, at the point of entry, whether it’s worth your time investigating something or not. There’s another layer of exploration too, courtesy of the new DSS, or Detailed Surface Scanner. Similar to Mass Effect 2’s weirdly addictive probing minigame, but much deeper and more involved, this lets you launch probes at a body discovered via the FSS to create a detailed image of its surface. You don’t even have to fly around a planet to get to other side: you can use its own gravity to slingshot probes around it, which is really satisfying to watch. There’s a skill element here too. Probes are infinite, so you can fling dozens of them at a planet and wait for the mapping percentage to tick up to 100%. Or you can try and hit an efficiency target set by the game—say, mapping a moon with just six probes—for a credit bonus. All of these layers combine to make exploration much more engaging and rewarding, and something I’ll be dedicating a lot more time to than I ever did before. This update also comes with a new ship, the Mamba. Based on a classic ship from the original Elite, this nippy combat craft can reach a boost speed of 435 m/s and is perfect for hit-and-run bounty hunting. The design of the ship is slightly reminiscent of an old sports car, which is no accident: art director Chris Gregory used a photo of a vintage racing Ferrari as a starting point. If you want to know more about how Frontier conceives and designs its ships, here’s a feature I wrote earlier this year about the process. 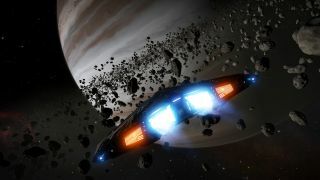 For an exhaustive rundown of everything Beyond: Chapter Four brings to Elite Dangerous, check out the official patch notes. I must admit, I’m something of a lapsed Elite player, but I think this update is the one that’s going to drag me back into my old Cobra’s dusty cockpit. If only because it’ll give me something more interesting and enjoyable to do when I’m out there in the darkest depths of space taking screenshots of my ship in front of things.